I love this soup. 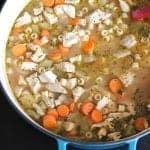 It’s a great “comfort food” soup with some of my personal favorite ingredients inside. You’ll see that I use “Florentine” in many of my recipe titles, I love spinach. The beef stew meat makes this soup nice and hearty. Great quick fix meal, both my boys, even my picky husband ate it up. I know everyone gets freaky about using heavy cream, but don’t look at the fat and calorie count on the back of the carton and just drizzle a little over the top of your soup. It’s seriously fab! Don’t forget a little piece of garlic bread. Hope everyone has a great week. I’ve got some yummy cookies coming this week, so stay tuned! 1. Place olive oil into a large dutch oven over medium heat. Saute onion and carrots for 5-7 minutes or until slightly softened. Stir in stew meat, salt and pepper. Cook until browned and cooked through. Stir in fresh garlic for 1 minute then stir in broth and tomatoes. Increase heat to medium high until soup comes to a light boil. Pour in pasta, reduce heat to medium and cook for 10-12 minutes or until pasta is al dente. Reduce heat to low and stir in spinach leaves. Let simmer for 20-30 minutes. Serve each bowl of soup with a drizzle of heavy cream, a spoonful of parmesan cheese and basil ribbons. This looks delicious. I’m gonna have to try it out! I might be able to pass this soup off as dinner to my hubby. Usually soup = “what’s the main dish?” Ug! I can’t even imagine snow right now! It’s going to be sunny and mid 80’s today! Hope you enjoy playful professional! I have the same issue with my husband. If it’s not ultra chunky, he says he’s hungry 1/2 later! Babies! That looks really good. I too am a fan of spinach! I will have to try it. Nice! Cream in everything! Gee, just a little won’t hurt anyone! Can’t wait to see the cookies! I need some cookies! Have a great week, Jenny! I for one love heavy cream, so I’d probably have to add a bit more than a drizzle. This looks fantastic! It sounds delicious! And I’m never afraid of a little bit of cream! The soup looks great. I’m a spinach lover as well. Raw or cooked I just love it. Yum, sounds great! I love basil. If you enjoy spinach, you should love this! I’m with you Catherine, drizzle people! Just finished my cookies, I’ll post them soon. They are ridiculously easy. Enjoy Melanie, I’ll be drizzling on the heavier side too! I agree Furious Ball hope you enjoy! That soup looks wonderful! I also love spinach in lots of things… and adding florentine to the name of a dish makes it seem so much better! 🙂 I’ll mark this one for a cooler day… I am hoping warmer weather is on the way! This soup sounds tasty. I like the idea of using heavy cream and parmesan in a soup like this. What a delicious meal! I added a bunch more vegetables (I’ve been told they are good for you) and used different pasta but it still turned out amazing! Have to add extra water upon reheating leftovers – the recipe makes a lot of food! – and the heavy cream addition is marvelous. Thanks for the recipe, it was incredible! It was damp and chilly here today and your soup made a great dinner. Even my picky ds ate it! Making this for dinner tonight! Just went out and got the last of the ingredients 🙂 cant wait to make it and see what my somewhat picky roommates think…hey, if they dont like it, more for me!! encountering problems with your website. It appears like some of the written text within your content are running off the screen. This has become my favorite soup of all time. Thank you so much for this recipe! Absolutely LOVE the flavor profile. Amazing. If you add the pasta, let cook for 10-12 minutes, then add the spinach and simmer another 20-30 minutes, won’t the pasta be totally mush by then? It sounds wonderful, just concerned about the Al-dente pasta becoming mush.